While the idea of sitting through 7 hours of theatre may seem daunting, it’s important to note that each part of The Inheritance is a self-contained play, i.e., you can technically see one without seeing the other. If you are determined to only see one of the plays, I highly recommend that it is Part 1, however, I recommend more strongly that you see both. Following a highly successful run at The Young Vic theatre, Matthew Lopez’s two-part, seven-and-a-half-hour play The Inheritance transferred to the Noël Coward Theatre in London’s glittering West End – and rightly so. This is a play that should have a permanent feature in London’s theatre landscape; in every city’s theatre landscape, in fact. This is a play that will make you laugh, move you to tears and teach you about the harrowing events that the LGBTQ+ community has survived, as well as the issues still facing the community today. I would go as far as to say that this is not merely a play; it is far more profound, far more transcendent. It is, in short, the epitome of what theatre should be. Matthew Lopez’s writing is nothing short of genius. 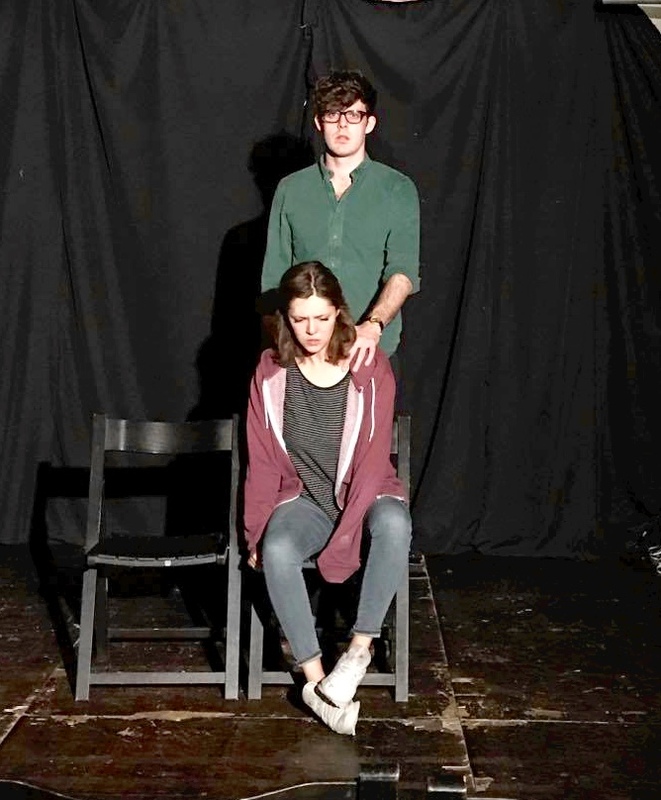 From hilarious quips and quick wit to poignant monologues and graphic accounts of sexual experiences, there is no line without purpose, no word wasted, and not a single fault to be found in this script. The production, masterfully directed by Stephen Daldry, is staged with practically no set and very few props, yet every scene is bursting with such vivid descriptions that it comes to life right in front of you, without the need for assistance from physical objects or sets. What Lopez does with flawless precision, though, is create humans: his are not just characters in a play, they are men who are complex and conflicted, and who yearn for a place in this world, just as any other person does. From the inherently kind-hearted Eric Glass (played by Kyle Soller) to the deeply damaged Toby Darling, child of privilege (played by Andrew Burnap), you’ll become whole-heartedly invested in every character and the stories they have to share. Each cast member deserves recognition for their incredible performances. Even the characters with the shortest stage time are wholly entrancing, which only serves as a demonstration of the incomparable talent of this cast. However, it would be impossible for me to not mention Samuel H. Levine, who plays both the well-off actor, Adam, and the young rent boy, Leo, who’s story was one of the most captivating features of the play. Also deserving a special mention is Paul Hilton, who doubles as E.M. Forster (Morgan), upon whose work this play comes to fruition, and as Walter, perhaps the most remarkable of the characters. Both actors are, quite frankly, too remarkable for words. I could write endlessly about these plays, trying, and probably failing, to explain in any comprehensible way just how thought-provoking, triumphant, moving and profound they are. In truth, I cannot recommend them enough and I cannot praise them enough – nor could anybody else for that matter. All I can really say is: when you see them, you’ll understand. Don’t miss out on The Inheritance at the Noël Coward Theatre until January 19th 2019! The atmosphere is charged from the very beginning, with the opening notes of the piano that Fehinti Balogun is ‘playing’ immediately setting the pace that the rest of the play is to follow and filling the stage with a certain air – an air which later proves to be rampant sexual tension. The chemistry between the cast is electric, with Balogun’s Algernon serving as the perfect opposite to Jacob Fortune-Lloyd’s Jack; watching Algernon as he danced gleefully on Jack’s every last nerve, and seeing the latter unravel as a result, was the single most satisfying thing I’ve seen play out on a theatre stage for a long time. An unsurprisingly divisive element of Fentiman’s adaptation is Algernon’s bisexuality: while it could be viewed as a problematic plot element, personally it simply adds to the whimsical nature of this character and reflects the values that he himself expresses about love and romance. I take great pleasure, however, in stating that it is the female cast members that steal the show. Pippa Nixon’s Gwendoline is truly hilarious: from her less-than-subtle flirtatious exchanges with her beloved ‘Ernest’ to her on-again-off-again friendship with Cecily, there is not a dialogue that is not seized upon and mined for its comedic value. 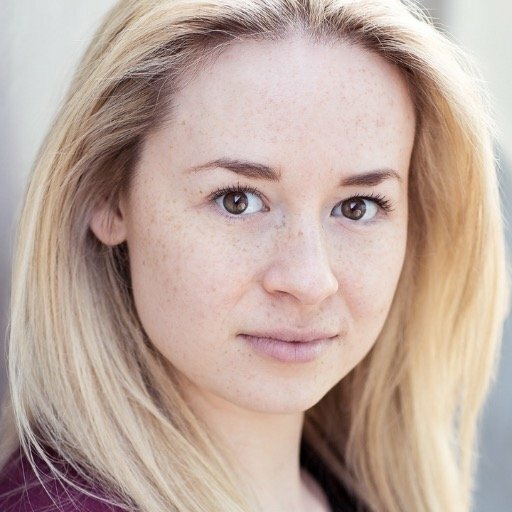 Jack’s sweet ward, Cecily, is perfectly portrayed by Fiona Button – she is flirtatious, she is bold, she is fabulous, and does well to not be overshadowed by the heavyweight and audacious characters that she shares the stage with. And, of course, Lady Bracknell. Sophie Thompson had big shoes to fill with the past iconic performances of this role, but if she was feeling the pressure to do it justice, it certainly didn’t show. From the moment she enters each scene, her dominance is apparent, with characters and audience alike holding their breath while she asserts her will in an operatic manner. This is a comedic masterpiece through and through, from the obvious wit and epigrams of Wilde’s original text to the more subtle and playful elements that Fentiman adds, there was barely a moment that did not warrant a laugh from the audience. It was a simple joy to watch the riotous events play out with hilarious repercussions. If you don’t wanto miss out on the final play of Classic Spring’s Oscar Wilde Season, grab tickets right here, and if you’re still not sure, click here for all the reasons why you need to see this latest production of Wilde’s classic. After a fantastic opening night, The King & I looks set to become a West End smash-hit. Reviews are pouring in, hailing it as a five star unmissable show. From The Box Office blogger Kennedy Porter was lucky enough to see the production during previews and has written us our very own review. Heart-warmingly nostalgic are the two words that predominantly stuck with me after seeing this incredible adaptation of the classic film. Having never actually seen the film, I wasn’t sure if I would experience the full effect of the magic or understand the humour, however I wasn’t just pleasantly surprised, but genuinely blown away. Kelli O’ Hara is sensational as Anna, perfectly capturing the essence of a woman who is not afraid to stand for what she believes in. Vocally, her performance is stunning, reminiscent of Julie Andrews’ Mary Poppins, which only adds to her charming air and the heart-warming feel of the production as a whole. The chemistry between O’ Hara and Watanabe simmers from the moment they first share the stage, building subtly with every scene, right up until the explosive climax between Anna and the stubborn King. Even as he lies weakened by illness, it seems as though the final ounces of strength that he needs come from the fire that she ignites within him. Of course, the King and Anna aren’t the only ones involved in a complicated relationship. The show’s young lovers, Dean John-Wilson (Lun Tha) and Na-Young Jeon (Tuptim), both shine as young souls separated by old traditions and provide a Romeo and Juliet-esque tragedy that will bring tears to your eyes and have you cursing the powers that be for daring to keep them apart. Ken Watanabe is nothing short of spectacular. From humorous confusion to intimidating, domineering and child-like stubbornness, there is no moment in which his performance doesn’t demand your complete attention, just as you would expect from a King. Overall, this new production of a classic tale ticks every box, even the ones that you wouldn’t have thought you wanted ticked. It’s funny and light-hearted, and provides a comic look at outdated attitudes that you’ll realise still exist even today, all while also being intense and suspenseful. It will make you laugh, it will melt your heart, it will dazzle you. In short, it’s sensational. If you don’t have plans to see The King and I, you need to change your plans as soon as possible. It’s two delightful hours of light-hearted humour and touching romance that will leave you feeling nostalgic and like a child all over again. Have you seen the show already? Sound off in the comments and let us know what you thought! You might be forgiven for approaching the Wyndham’s Theatre with a sense of trepidation for a play which lasts 3 hours and 20 minutes. Eugene O’Neill’s master work is a tour de force for any five actors brave enough to tackle this monumental drama and at its heart, O’Neill’s semi-autobiographical Long Day’s Journey Into Night is a soul-searching examination of claustrophobic family dynamics, drug and alcohol dependency. Much of the Bristol Old Vic’s production is commendable. The set is a clever interweaving of period design and minimalist modernism, it’s monolithic glass structure both encapsulating the feeling of claustrophobia and yet bringing in the threat of the “outside” with symbolic references to weather, the ebb and flow of coastal fog echoing the haze of morphine-induced mental decline of the matriarch, Mary Tyrone. The Tyrone family’s summer home, a mixture of wood and wicker mismatched furniture, grand but not affluent, evokes the state of the family’s finances, but as the play unfolds it becomes clear that this is perhaps more emblematic of the miserliness of Mary’s husband James Tyrone (Jeremy Irons) than a lack of wealth. Irons is a dashing Tyrone and what he lacks in gravitas he makes up for in handsome grace. James Tyrone’s relationship with his wife is complex. There are moments of cruelty – as James tells his sons “She’s so fat and sassy there’ll soon be no holding her” but rather than intending to insult, these barbs come with a sense of genuine affection which is at once unsettling and reassuring. The deliberate overlap of dialogue gives early scenes a sense of pace but occasionally the cacophony of voices can overwhelm the subtleties in the dialogue. Jeremy Irons and Lesley Manville embrace, but can their love survive through the fog of addiction? Lesley Manville’s virtuosic portrayal of Mary is as vulnerable as it is statuesque. She seems to live on her nerves – hardly surprising with one son throwing away his salary on whores and whiskey and the other a sensitive consumptive. The fog which seems to blight seaside Connecticut symbolises Mary’s mental state, as she stumbles through her days in a haze of addiction. Often it is their sons who speak plain truth. 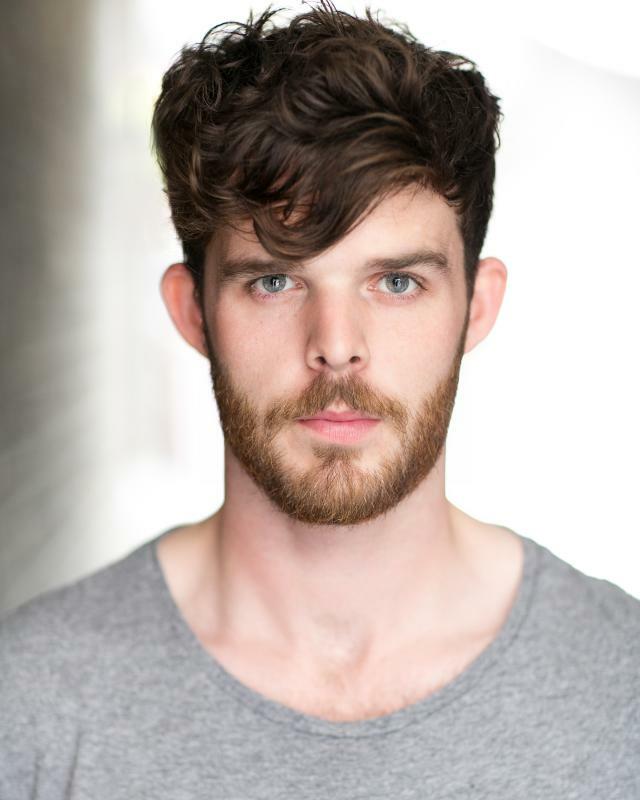 James Jr (Rory Keenan) in whom whiskey seems to liberate verity, often at the expense of tact, seems to say what no-one else can – or what they choose not to. Keenan’s performance is solid, but bearing a passing resemblance to Brad Pitt helps distract from a vocal delivery that occasionally put me in mind of Krusty The Clown (another off-shoot from a dysfunctional American family). James Jr (Rory Keenan) – plain speaking and whiskey swigging Brad Pitt look-a-like. 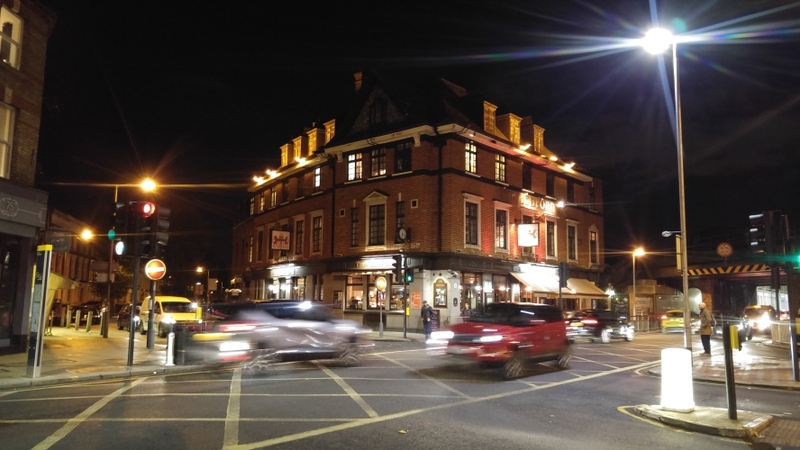 Mary’s frail nerves are not helped by a sense of homelessness – this summer home giving way at long intervals to time spent on trains and in hotel rooms. Her sense of envy is palpable when the neighbours drive by in their new Mercedes but it’s their seeming respectability rather than their car which she really envies. “I have always hated this town and everyone in it” is said without malice, and there is a heart-breaking honesty when she tells her husband that “this home was wrong from the start” and that “the only way is to make yourself not care”. Her neurosis plays heavily upon her relationships with her sons, both of whom care deeply for their mother, often manifesting itself in obsessing about details “Why do you look at me like that – is my hair coming down?”. Their father is seemingly trapped by his own obsessive compulsion to acquire ever more properties, albeit with mortgages attached – and both are victims of their own past. Edmund, the younger son, is prone to coughing fits and is a cerebral being whose primary concern should be his own health (he is suffering from tuberculosis) but seems to care far more for his mother’s wellbeing. Edmund (played by an introspective Matthew Beard) is well-read and well-travelled – but in seeming to wish to portray this, O’Neill’s play often dwells in long languorous conversations about Neitzsche, Oscar Wilde and Walt Whitman. While providing intellectually stimulating insight into O’Neill’s own influences (they are viewed with suspicion by James Tyrone who is a Shakespeare purist) conversations result in scenes which are often overly long and dramatically tiresome. 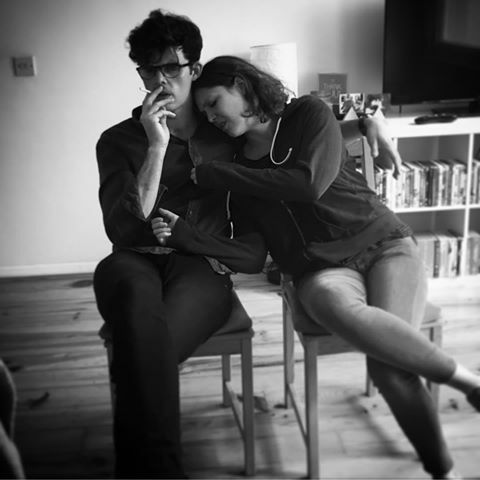 In a family dynamic further complicated by Mary’s blaming James Jr for the infant death of her second son, and accusations that her morphine addiction is due to her husband employing the cheapest doctor possible, scenes often repeat the same points and as a result the play feels over-long. 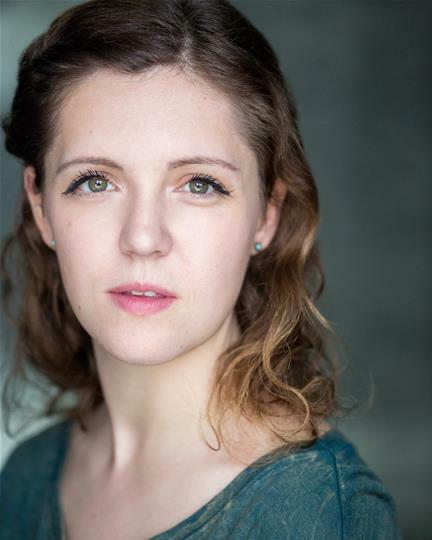 Much needed comic relief is provided in the form of feisty Irish servant Cathleen (Jessica Regan) who lights up the stage every time she strides onto it. Eugene O’Neill’s play is, as an intellectual examination of family dynamism and literary philosophy, a work of undoubted genius and Lesley Manville gives a performance worthy of an Olivier Award. For those reasons alone, this is a production worth seeing and worth sticking with. For this theatregoer, I just wished it had been 45 minutes shorter – sometimes, even in the presence of greatness, less is more. You can buy tickets here for Long Day’s Journey Into Night for performances until 7 April 2018. Launching Andrew Lloyd Webber’s new venue with a production of Michael John LaChiusa’s The Wild Party was always going to be a risk. There’s the inevitable confusion when a show has two versions (remember Ken Hill’s version of Phantom of the Opera?) and people know the songs in the other version (by Andrew Lippa which featured Idina Menzel). LaChiusa’s version, nominated for a Grammy and 7 Tony Awards, has arguably the more intelligent score, weaving intricate jazz with the original Joseph Moncure March narrative poem and keeping closely to the spirit of 1920s prohibition America. But where the LaChiusa version triumphs in cleverness, at times its songs merge into a messy soup of similarity. Drew McOnie’s direction relies a little too much on his strength as a choreographer, at times seeming to come at the cost of deeper characterisation. There’s a scene near the beginning of the show where the show’s leading lady, Queenie (played with throaty lasciviousness by Frances Ruffelle) is strapped to the bed like a grown-up version of Regan in The Exorcist: fortunately we were spared the crucifix, but we were also spared the thrills. Fortunately, each time Act One begins to lag, another guest arrives. And this is quite a party: just about every invitee seems already to have consumed a lifetime’s supply of narcotics on their way to Burr’s & Queenie’s somewhat minimalist residence (hats off to a clever use of multiple staircases). And it’s here The Wild Party both earns its name and hits a snag. The dynamic of Act One is simply too high, too soon. Rather than grow and beguile, drawing the audience in, we’re instead treated to a talented cast working their socks off simply to make their characters seem real. Each seems to have a hollow emptiness, existing in a theatrical vacuum and whereas Kander & Ebb’s Cabaret breaks up the moral bleakness of the era with musical brilliance, here the songs simply ring with a hollow despair. Fortunately, the excellent band more than makes up for any lack of dynamic in the song-writing and their positioning above the stage provides a clever juxtaposition of order and disorder – even if the audience struggle to hear vocals as a result. I struggled at times with elements of the book & lyrics, not only in not being able to hear them properly (The Other Palace seems to have inherited the sound problems of the St James’ Theatre) but also in somewhat outdated references to black people being “more chocolatey” and a brief discussion about Jewish people changing their names to sound less Jewish (a theme which seemed to be ditched with completely in Act Two). Those themes are never explored and accordingly I felt like the piece was simply paying lip-service to certain characters. But in other ways, Act Two improve enormously. Where Act One seems to spend overly-long introducing one character after another, the dramatic arc post-interval is rather more elliptically fulfilled. As the mood of the party shifts, the piece darkens deliciously and dynamic bonds between characters are strained to breaking point. One scene in particular is handled brilliantly, but will shock the most seasoned theatre-goer. From a top-notch cast I must single out Simon Thomas, whose matinee idol looks and slinking physicality bring a feline suavity to Black, Victoria Hamilton-Barritt is a smouldering and deliciously funny Kate and relative newcomer Dex Lee arrives with a bang as the explosive Jackie who delivers one of the night’s most genuinely shocking moments. But the rest of the cast, too, are from the very top drawer of Musical Theatre; Frances Ruffelle and John Owen Jones are ably supported by an on-form and bitingly funny Tiffany Graves as weary stripper Madelaine, Gloria Obianyo and Genesis Lynea as The D’armano Brothers and Donna McKechnie as faded leading lady Dolores. At times, I did wonder if this wouldn’t have made better straight play than a musical. The vaudevillian theme, set at counterpoint to the intimacy of the party, would surely have packed a greater dramatic punch were there not so much actual music. 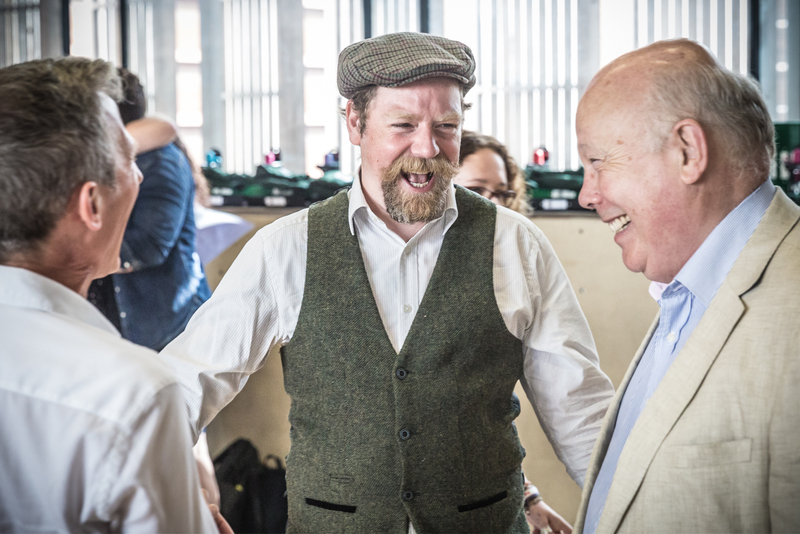 John Owen Jones is a wonderful Musical Theatre actor, but where the scenes between Burrs and Queenie should have electrified, they simply shocked. One final word of caution when booking: Sadly, Sir Andrew Lloyd Webber has seen fit to preserve the curved seating at either end of the first few rows, so consider this when booking and avoid those seats if you’re tall. Buy tickets for The Wild Party – booking until Saturday 1 April. I came late to Khaled Hosseini’s The Kite Runner having somehow never read the Best Selling novel first published in 2003 or seen the 2007/8 film adaptation. I finally put that right with a beguiling stage version now running at the Wyndham’s Theatre – and it’s sheer delight. The story concentrates on Amir (Ben Turner) and his friendship with Hassan (Andrei Costin) in 1970s Afghanistan. Amir has a privileged life: Hassan’s father is servant to Amir’s father, so Amir and Hassan’s friendship is genuine but hierarchical. Where Amir’s education has enabled him to read & write, Hassan, by contrast, is illiterate: something Amir delights in when he explains that “imbecile” means “intelligent”. Hassan looks up to Amir, not just as a friend but as a superior. His status as servant is dictated not just by his father’s position in the household, but by their Hazara (Shi’a) minor ethnicity – a sect widely looked down upon in Afghanistan. 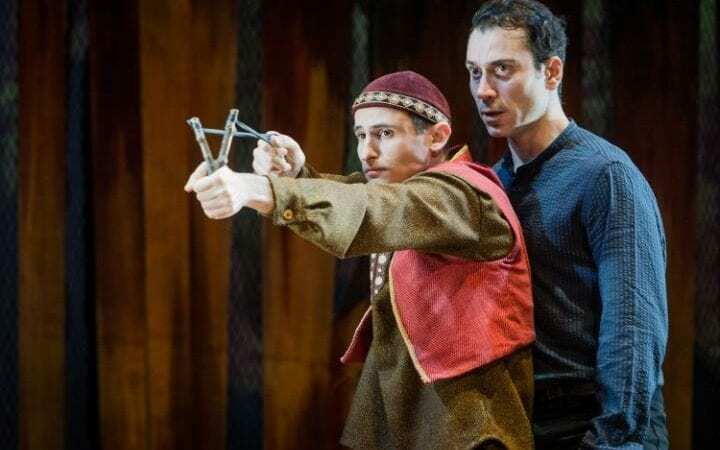 There is a great deal of humour in the play’s early scenes, with Matthew Spangler’s skilful adaptation deftly revealing the social complexity of Amir and Hassan’s friendship in a series of vignettes reminiscent of Blood Brothers. The young Amir may be educated, but even his naivety shows through when he asks his father, Baba (Emelio Doorgasingh) why John Wayne doesn’t speak Farsi since he is Iranian? But, there are truths buried in Kabul and truth has a way of clawing its way to the surface. Kabul pre-1973 was largely peaceful, at least if you had money. Whisky was drunk and life was relatively carefree. The young Amir showed a skill for storytelling. In Hassan he had a captive audience, but Baba was largely disinterested – just wishing his son be more brave. Amir’s first story, of a man who discovers a magical bowl into which every tear cried becomes a pearl becomes a parable; the bowl is found by the happiest man in the world but whose greed ultimately overpowers him. The play’s first truly chilling moment comes in the form of the bullying Assef (Nicholas Karimi). Karimi’s physical portrayal of the Sociopathic Assef is uncomfortable to watch as Amir is confronted in the street. Only the threat of Hassan’s slingshot saves them on their first meeting, but it is portentous and all the more chilling in hindsight. Barney George’s design, Charles Balfour’s lighting and William Simpsons’s projections are simple but highly effective, allowing seamless transitions from homes to streets with just the drop of a curtain or moving of a trunk but it is the soundscape created through a mixture of pre-recorded sounds and live drums, wind and Tibetan prayer bowls, which really creates the show’s unique atmosphere – hats off to Jonathan Girling and Drew Baumohi. The show’s title comes from the traditional afghan sport of Kite Fighting, where kite flyers compete with one another using strings sharpened with broken glass to try to cut the strings of other competitors. It’s after Amir’s greatest victory that Hassan runs to retrieve the blue kite he has cut down and is confronted once again by Assef. Amir arrives but, gripped by fear is too afraid to go to his friend’s aid as Hassan is raped. The moment changes everything for both boys and tears two friends apart. Unable to bear the shame he feels for not going to Hassan’s aid, Amir begins to avoid his friend and then to shun his company entirely. Deciding it would be easier if Hassan were not around at all, he asks his father whether they could get new servants, and then in desperation, conceals money and a watch under Hassan’s bed. In an act of pure self-sacrifice, Hassan confesses to a crime he has not committed, and even though Baba forgives him, Hassan’s father decides that they cannot stay where his son has broken trust and the pair leave the home they have known for forty years. Act two begins with Amir and Baba’s fleeing Afghanistan following the overthrowing of the regime and subsequent Russian occupation. Smuggled in the back of a suffocating truck, the journey into Pakistan is fraught with risk and should be a lesson for anyone thinking that those fleeing war-zones would ever do so lightly. The cast do a great job with frequent switches of costume and character and Ben Turner’s solid central performance gives the twisting story a strong anchor through a story which moves not just a country away, but soon to the other side of the Earth. A slightly clichéd introduction to life in America follows, playing to stereotypes and is perhaps director Giles Croft’s only misguided moment. A new life begins for Amir as he embraces the new possibilities before him. Romance blooms in the form of Soraya (Lisa Zahra) in a Flea Market where old ways survive but new lives must be pursued. Baba lives to see their wedding but soon afterwards succumbs to cancer. After Baba’s death, the return of his father’s friend, Rahim Khan (Nicholas Khan) reveals a shocking truth to Amir requiring a move in the story back to a post 9/11 Afghanistan, with new and still more terrible risk. 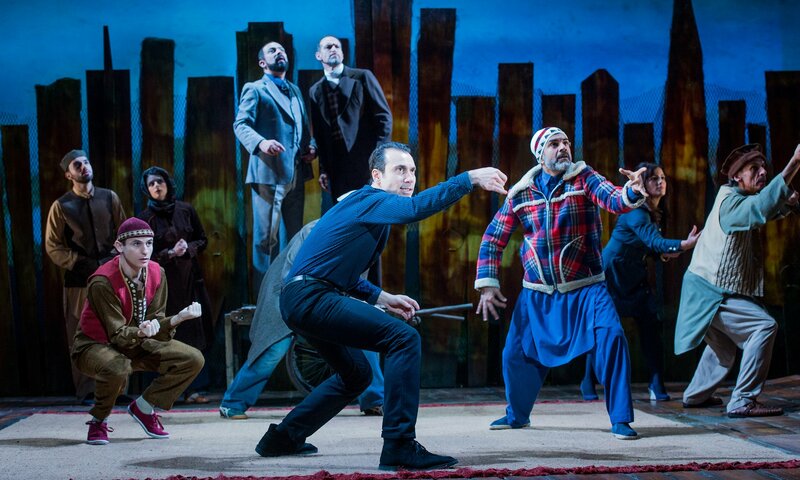 The Kite Runner offers a tantalising glimpse into a country of extremes and confusing beauty. Ben Turner’s central performance is solid and touching, and Nicholas Karimi’s disturbing portral of Assef is remarkable. 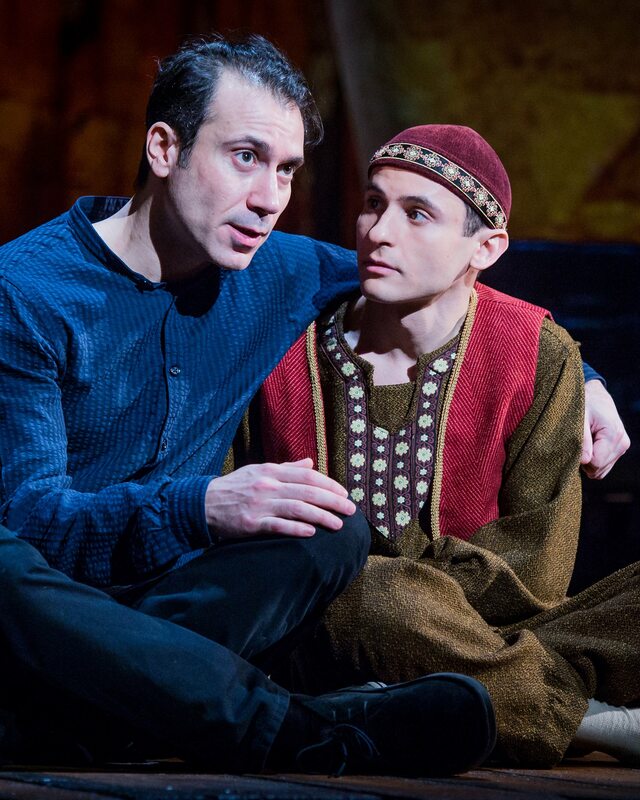 But for me the show’s star was Andrei Costin’s utterly endearing and heartbreakingly vulnerable Hassan. 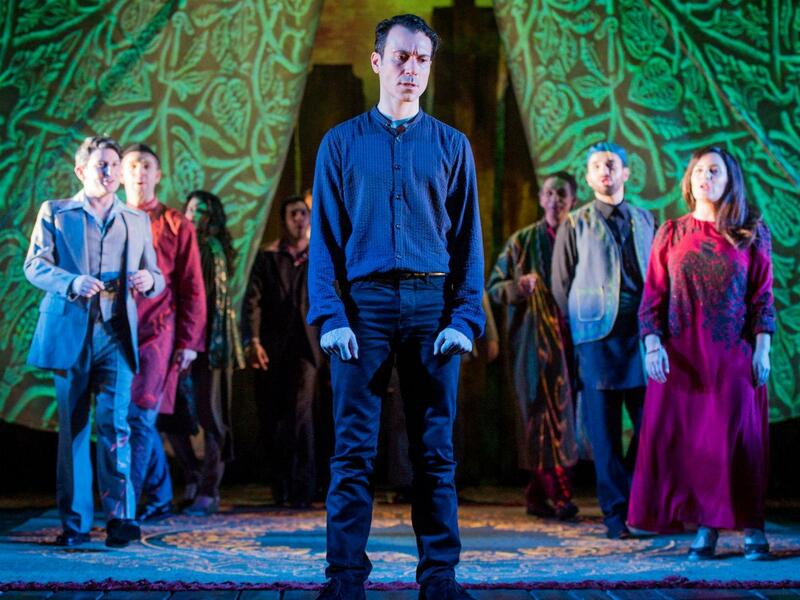 At times, particularly in Act Two, the storytelling begins to feel a little laboured and the show would benefit from a few tweaks to speed the story along, but this warts-and-all story of a privileged but damaged life in Kabul reveals a side to Afghanistan that few Westerners see and never forgets that humanity can be found in even the darkest corner of our world. If you love your musicals Christmassy and camp, pop on a scarf and head south to Stockwell, where a passionate group of amateur performers is taking on Alan Menken’s A Christmas Carol at South London’s lovely Lost Theatre.